A recent Wired magazine article on social commerce refered to Dan Ariely’s book Predictably Irrational. The article prompted Paul Marsden of Social Commerce Today to do a really helpful overview of the book. When I saw this I thought “great, this can be my dummies guide to behavioural economics”. But actually it makes you think more about the topic and read more (I’ve just ordered the book as a result!). This is a long post I know…but its worth the read, if you dont have time now, print it off and read it later. “The top-line is that shoppers are not rational actors, but irrational reactors……..Rather than process information rationally and act accordingly, shoppers use simple and usually smart rules of thumb to choose that can sometimes prompt irrational behaviour. Some of these shopping cues use social intelligence – our ability to understand and learn from each other and profit from social situations – and others are a consequence of our “bounded rationality” (human rationality bounded by limitations of time, data and processing power). The Cost of Social Norms: Why we are happy to do things, but not when we are paid to do them. Consumer behavior is patterned by two sets of norms – social norms (implicit rules of social interaction) and market norms (explicit and hard transactional business rules) – understand the norms at play and don’t mix the two. For example, encourage consumers to spread the word to help their friends, but don’t pay them to do it. Use social norms where possible rather than create new market norms with financial rewards or fines – these have a tendency to backfire. When a school tried to reduce late-arriving parents by issuing fines, the problem got worse, not better – the fine created a market norm, a paid-for transaction that legitimized the undesirable behaviour. The High Price of Ownership: Why We Overvalue What We Have. Consumers are irrational insofar they overvalue things once they own them. This is because we suffer from “loss aversion” – we don’t like losing things. Harness this “Endowment Effect” and the psychology of “Sunk Costs” by getting your product into the hands of influencers – once they own it, they’ll advocate it. The Effect of Expectations: Why The Mind Gets What It Expects. Previously-held expectations irrationally cloud our point of view and even sensory experience. Tell a consumer they’ll like something and they will. Tell them they won’t like something, or use negative associations, and they won’t. So tell consumers what to expect, or better, get happy customers to tell new customers what to expect, and that’ll be their experience. The Context of Our Character, Part 1: Why We Are Dishonest. People are irrational when it comes to honesty; most people will try to be honest, and be seen to be honest when it comes to major transgressions (e.g. major office theft), even when there is no chance of getting caught. But for small transgressions (e.g. stealing an office pen), otherwise honest people will be dishonest. With conscience, size matters. Priming people’s minds with honest behavior may encourage honest behavior – seeing someone hand in a lost wallet, will prompt them to do likewise. Seeing a customer help another customer will prompt them to do likewise. The Context of Our Character, Part 2: Why Dealing With Cash Makes Us More Honest. Money, like power, is often said to corrupt, but money actually helps keep honest people stay honest. Put a Coke in a communal fridge and it will disappear, put dollar bills in the fridge and they’ll stay there. Play a game with tokens, people will cheat more than if they play a game for money. Dealing with cash cues customer honesty. Does this mean people will be less likely to cheat on returns (buy for party and return) if you show the dollar cost to you of returns? Worth a try. The Truth About Relativity: The human mind uses comparative thinking to make decisions, comparing options on offer, and comparing ourselves to others – and this leads to irrational behavior. For example, you can use the decoy effect to boost sales of a product by adding a decoy product to your product line that you don’t intend to sell, but has extreme pricing, either much higher or much lower than other virtually identical products. This will boost sales of products that were previously the highest or lowest priced, as they are comparatively cheaper (or better quality for low priced goods – price is irrationally associated with quality). High street retailer Williams-Sonoma used this technique to boost sales for bread making machines adding a “deluxe” version that was virtually identical but 50% more expensive. The Fallacy of Supply and Demand: Another irrational consequence of comparative thinking. When we walk into a store, the first price (or even arbitrary number) we see becomes an “anchor” we use to judge whether other goods are good value. “Anchoring” has a major long-term effect on our willingness to pay. We have behavioural anchors too, like the experience of a Starbucks coffee becomes an anchor point to which we compare all other café experiences. Understand the anchors at play, you’ll understand the consumer. The Cost of Zero Cost: Why we often pay too much when we pay nothing. Zero/free is a source of irrational excitement; it’s called the “zero price effect.” Consumers will trade-up and pay more just to be able to get a free gift or bonus, such as free shipping. And they’ll will wait in line for absurdly long times or go to extraordinarily long lengths to get something for free. As Amazon rolled out free (Super Saver) shipping across markets, sales increased accordingly. Free is the most valuable word in marketing. Keeping Doors Open: Why Options Distract Us from Our Main Objective. Consumers feel compelled to preserve options, even at great expense – energy, time and money, even when it doesn’t make sense. When you want consumers to make a decision, close down their options to good and bad, but position your brand as opening doors and opening up new opportunities, rather closing them down. The Power of Price: Why a 50-Cent Aspirin Can Do What A Penny Aspirin Can’t. Price has an effect on experience. A fake pain killer can work by the placebo effect – expectations trigger endorphins and opiates and other biological reactions that actually change body and experience, and it will work better, the higher the perceived price. Expensive (branded) goods are experienced as better. Beer and Free Lunches: What Is Behavioral Economics, and Where Are the Free Lunches? Consumers are far less rational in their decision-making than most marketing models of consumer behaviour predict. But their irrational behaviors are neither random nor senseless, they are systematic and predictable. For instance, consumers will sacrifice personal pleasure for public image – the reverse-herd effect, choosing to be different to be seen as being different, even if they prefer what others are doing. So base your social commerce strategy on how customers actually behave, not their values, beliefs and opinions nor on rational choice theory. Behavioural economics is a behaviour-first tool for smart retailing based on how consumers are, not how they say they are. Its probably ridiculously obvious to state that I admire Richard Branson, but I do! I mentioned a blog post that he did last year to someone recently. The stand out from the post was how Branson used to go into a company once it had 100 staff, ask the MD who his two best staff members were and then he would take them and set up a whole new company! Another important task is to make sure the companies don’t get too big too quickly. If anything, we have a bias to keep things smaller rather than larger. The feeling and the way that we run them, with delegation that we push down into the companies, is not a very corporate fashion. We tend to manage our businesses in a much more delegated style, where we empower the managements to manage. Then when those two companies got to another 100 people each we did it again. In the Notting Hill Gate area we ended up having 18 different record companies. 18 different switchboards too, we didn’t try to save on central costs. With the combination of them put together, we had the biggest independent record company in the world – the fifth biggest overall. I also really admired how he is so open about the fact that he knew what he didnt know and knew that he should surround himself with people who were better than him in certain areas. I think all too often we believe we have to be great at all aspects of our business and that it is a sign of weakness to admit that you arent. I think employers often don’t help this perception. I think knowing what you dont know is as important as knowing what you do. I realised I couldn’t do everything myself. I had to learn the art of delegation and try to find people who are better than me to run the companies – that wasn’t that difficult! Also, finding people who are more managerially-inclined rather than entrepreneurially-inclined was important. So from an early age I would always try to put myself out of business so I would be free to think about how to take the Virgin Group into a new era. One of the jobs was to find a great managing director for the Virgin Group, which I did in Stephen Murphy. For marketers, the old way of doing business is unsustainable. Not long ago, a car buyer would methodically pare down the available choices until he arrived at the one that best met his criteria. A dealer would reel him in and make the sale. The buyer’s relationship with both the dealer and the manufacturer would typically dissipate after the purchase. consumers are promiscuous in their brand relationships: They connect with myriad brands—through new media channels beyond the manufacturer’s and the retailer’s control or even knowledge—and evaluate a shifting array of them, often expanding the pool before narrowing it. After a purchase these consumers may remain aggressively engaged, publicly promoting or assailing the products they’ve bought, collaborating in the brands’ development, and challenging and shaping their meaning. when—at what touch points—they are most open to influence, and how you can interact with them at those points. In the past, marketing strategies that put the lion’s share of resources into building brand awareness and then opening wallets at the point of purchase worked pretty well. But touch points have changed in both number and nature, requiring a major adjustment to realign marketers’ strategy and budgets with where consumers are actually spending their time. Edelman goes on to challenge the famous funnel metaphor when thinking about touch points, but this metaphor fails to capture the shifting nature of consumer engagement. What is now being proposed is the “consumer decision journey” (CDJ). Far from systematically narrowing their choices, today’s consumers take a much more iterative and less reductive journey of four stages: consider, evaluate, buy, and enjoy, advocate, bond. The article goes on to highlight the four stages of the journey, which are well worth reading (in fact I may do a follow up post with them) and also goes on to give examples of the journey and discussing a new role for marketing. CLIC Sargent have launched an online campaign to name their new finger puppet. Puppets are a great way for play specialists when they work with children in hospital, they use the puppet to explain to a child what is going on with their treatment and it makes it less scary. CLIC Sargent will use this new finger puppet as part of their marketing campaigns in the coming months and are introducing him through cinema ads and soon will have a Facebook page for him/her and a You Tube Channel also. But before all that, and in what I guess is a teaser campaign, they are looking for people to suggest names for the puppet. 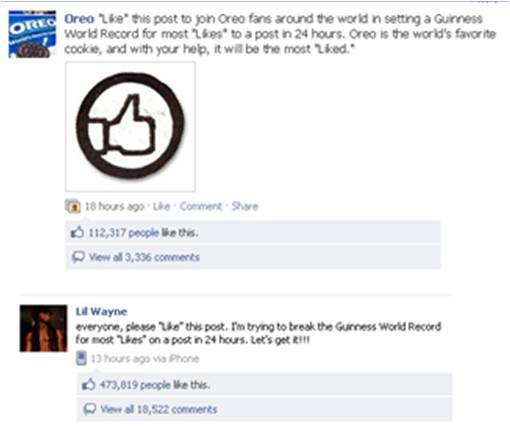 So Oreo and ‘Lil Wayne are going head to head to get the most number of fans to ‘like’ a post and set a Guinness World Record. When we talk about pages and posts on pages we talk about engagement and part of that engagement (on Facebook) that we look for is people liking what you post and commenting on it. So this race for the record seems to match up. But why don’t I like it. I feel that this is just doing something for the sake of it, it feels like a trick and isnt true engagement. I think a page and a post on a page should get likes because people feel the content is worth liking. Yes its about the content. To me this feels like Oreo and ‘Lil Wayne have nothing to say and so they have to pull a stunt to get us to their page. Surely they do have content that can drive likes.